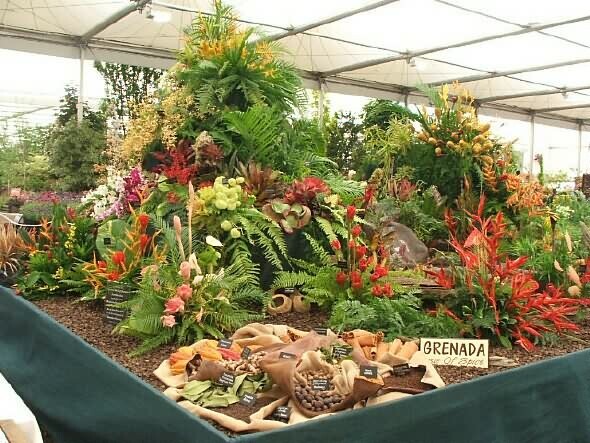 Multiple Chelsea gold medal winner Suzanne Gaywood and her Grenada-UK team, will once again display at the 2014 RHS Chelsea Flower Show from 20-24 May 2014. The exhibit entitled ‘Spice Isle’ reflects the name by which Grenada is known worldwide for its production of nutmeg, mace and a host of other spices. The Grenada exhibit has successively been awarded Silver (in 1998) and Silver-Gilt (in 1999, 2000, 2006 and 2008). Gold has been awarded from 2001 to 2005, 2007, and from 2009 to 2012. The focus of the stand will be displays of whole spices, and Grenadian flora. Suzanne’s design will highlight the rich vegetation typical of Grenada’s rainforest on one side and a beach scene on the other. Team members, John Criswick, Catherine John, and Fletcher Frank will be travelling to London on Thursday 15 May, with boxes of flowers, foliage and spices, to help stage the exhibit. Minister of Tourism and Culture, Alexandra Otway-Noel will visit the Grenada exhibit at Chelsea on Press Day, Monday 19 May. The minister along with hotelier sponsors, will host a high profile media event at which Suzanne will speak to what inspires her to create the wonderful exhibits that have been justly rewarded by 10 Chelsea Gold Medals. The Spice Isle–Spices, Rainforest and Beach exhibit at Stand No GPF/16, is sponsored by the Grenada Tourism Authority, Peter and Lana de Savary for Mount Cinnamon and Port Louis, Calabash Hotel, Coyaba Beach Resort, Lanwades Stud, Seafreight Line, John and Joan Buckenham, Hyde Park Tropical Garden, Reg and Trish Scarlett, and Blue Horizons Garden Resort.